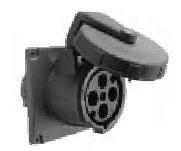 Gray Supertough« nylon dockside receptacle has gasketed, spring-loaded cover. Closes automatically when not in use and is watertight when securely fastened. Mounting holes are 47⁄8" (123.8) on centers. Mounting screws and gasket included.